Terraced house, 4 - 6 people, 2.5 room/s, 2 bedroom/s, 1 bathroom/s, approximately 45 m², 2 floor/s. Feature: Property in a holiday complex (210 units in total). 08/06-31/08. € 20 per person and week (depending on occupancy), children up to 11 years € 15 per child and week (depending on occupancy), 08/06-31/08. 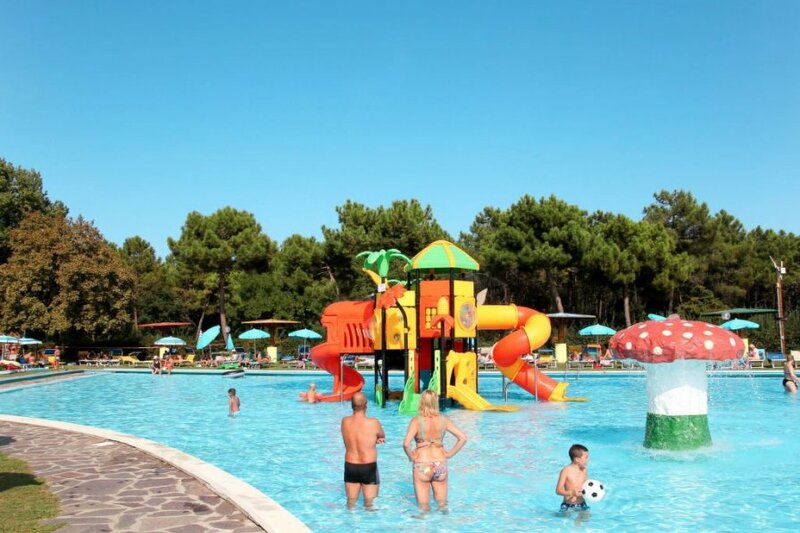 € 10 per person and following week (depending on occupancy), children up to 11 years € 5 per child and following week (depending on occupancy). Heating/air-conditioning if required, € 6/​day. Holiday resort tax. Linen/towels must be brought along. Bed linen available on loan, € 10 per person/​change (on order). Towels available on loan, € 5 per person/​change (on order). Deposit € 50 (in cash). Extra bed bunk bed, € 50 per person/​week (on order). Cot/​High chair only within the maximum occupancy, € 25 per week (on order). Pet 2 animals allowed, € 5 per pet and day (please advise prior to arrival). Estate (shared use with holiday guests): approximately 12 ha, closed plot, trees, lawn. Pool (shared use): 50.0 x 25.0 m, open throughout the entire season, children's pool. Pool 2 (shared use): 3100 m², 1.20 m deep, open throughout the entire season. Sports facilities/ leisure time: shared use (free of charge): tennis, volleyball, multi-purpose sports track, bowling/boccia, children's playing equipment. Restaurant, food shop; half board (dinner), full board, all inclusive: payment. Important information: Access to the houses is on Saturdays only possible to load- and unload the car. Access to the houses from Sunday to Friday only until the central parking lot. Plot description: Access: access only for loading and unloading, car-free complex. Terrace (roofed), furnishing provided, sunshade. The agent describes this apartment as a family friendly holiday rental ideal for the summer holidays. It is also good value for money. This apartment is located in Casalborsetti. The nearest airport is 105km away. It is set in a very convenient location, just 0 metres away from a beach and only 800 metres away from the city center.